Special Containment Procedures: SCP-3124 is kept in Locker A57 at Site-48's Low-Value Item Storage wing. In the event that SCP-3124 must be moved to another facility, consult Appendix D for a list of storage lockers that are located and oriented such that SCP-3124 can be placed inside. During transport, SCP-3124 should be kept in a large, empty, and well-secured container that allows for significant freedom of movement. Description: SCP-3124 is an object that resembles a standard black-and-white 32-panel football, though lacking in any imperfections or discoloration that would normally occur during construction or usage. SCP-3124's appearance remains the same under all lighting conditions, and it can be viewed as though intervening liquids and gases are not present. SCP-3124 possesses the same size, mass, texture, and elasticity as a normal football comprised of synthetic leather,1 though it is chemically inert and cannot be defaced or ruptured by any tested methods. Examination of SCP-3124 under high magnification has provided inconclusive results; it is unclear whether or not SCP-3124 is comprised of conventional matter. SCP-3124 follows a three-dimensional "taxicab geometry," in which it will only move along the lines of a 1.384m cubic grid of indefinite size, hereby the "movement grid." The motion of SCP-3124 is best modeled by determining the path a non-anomalous football would take when acted upon in a given manner, and then constructing the path along the movement grid that is closest to this trajectory. As such, SCP-3124's movement is often marked by abrupt 90° turns, and rarely functions intuitively. SCP-3124's movement grid is stationary relative to Earth and thus has a different orientation relative to the ground in different locations. Subjects that use SCP-3124 in a game of association football will fail to recognize its appearance or behavior as unusual, instead describing its anomalous properties as the norm for footballs. Players display an intuitive understanding of the rules governing SCP-3124's motion (including the size and local orientation of its movement grid) while playing, and will adapt their strategy and technique as necessary to account for its anomalous properties. Subjects display roughly the same level of proficiency at association football whether playing with SCP-3124 or a standard football. Additionally, under these circumstances, all subjects will refer to SCP-3124 as a "soccer ball" and refer to association football as "soccer," regardless of the terms they customarily use. History: SCP-3124 spontaneously appeared on 2014-06-09 at the University of Texas at Austin, in the office of Professor █████ ████████. Prior to SCP-3124's appearance, Professor ████████ was attempting to teach an artificial neural network to distinguish between images of balls used in various sports. 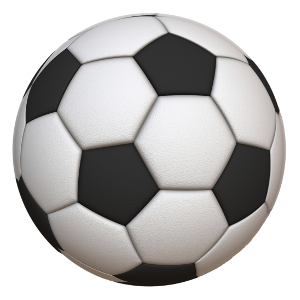 Professor ████████ reports that the program consistently labeled all input images as "soccer ball," despite repeated attempts to condition it to do otherwise. After several hours of failing to alter the program's behavior, Professor ████████ kicked his computer out of frustration; upon contact with his shoe, the computer disappeared and was replaced by SCP-3124. The aforementioned artificial neural network has not been recovered, and attempts to recreate it have not resulted in any unusual behavior. 1. Specifically, it has a mass of 430.0g and a circumference of 69.0cm — both within the bounds specified by FIFA.